We both went to the same all-girls, Catholic high school in New Jersey and we met at freshman orientation. We were both little nerdballs: she had yellow shoes that matched her yellow pocket book and a little Peter Pan collar. We rode the same bus to school and would talk the whole time. In those days students were put in tracks at school, and so we were in a lot of the same classes. She was always very gentle and non-judgmental. I’m a little bit more high-strung. Our personalities meshed, partly because of academics and partly because we grew up attending Catholic schools, so we had that same kind of orderly sense. As we were getting older, we didn’t want to be quite so strict. We saw each other every day at school and then would get together on weekends. When we went to the beach, I was always jealous because she was tall and thin and I was short and, at that time, a little bit of a chunkball. She had one brother and I come from a family of six. She liked the vibrancy of my family. I remember her once saying she was astounded watching my parents hold hands walking on a beach. Her parents would never do that. In high school, we were both part of a very dear, dear group of friends. We sat at the same corner lunch table every day. For each one of our birthdays, we decorated our corner, and were always fun and cheerful. When we went off to college, the connection was still there even though we were all at different schools. Susan went to Montclair State and I went to Douglass, both in New Jersey. She lived on campus and I commuted. I would visit her, most often for parties. When she had a boyfriend and things started getting serious, she was very nervous. She said, “I think I need to get birth control.” We were two little unsure Catholic girls, but I helped her figure out where to go and went with her. Both Susan and I were rule-followers in high school but we both married guys who were off-the-wall, loud, goofy, and attention-seeking. At one high school reunion, they were dancing on the table and sliding on the floor. Everyone was so shocked. I’m no longer married to that guy, but Susan stayed married to her husband. Although he always was loud and sometimes extreme, she kept him grounded and they were a perfect match. She was a non-judgmental, easy friend. She kept me calm. She was sweet, very sweet, and very steady. She taught me loyalty and gentleness. When we were in biology and it came time to dissect an earthworm, Susan could not deal with it. She was too kind-hearted. There were four people at our table and one of us had a probe, somebody had scissors, somebody had a scalpel and we gave Susan the eyedropper. Any time we had to dissect something she got the eyedropper. There is a saying that I remember seeing somewhere that said “a best friend is somebody you would trust to clean out your drawers if you died.” That’s probably not the most proper definition, but it just implies that you’re comfortable with somebody, you trust her and if she found something that was incendiary she’d know to throw it away. Susan was getting colds a lot. I remember after one of our high school reunions I asked her about her health and she just said, “Laura, I have breast cancer.” She had gone months and months earlier to have a breast lump checked and it was misdiagnosed. She went again, it was misdiagnosed again. So unfortunately, by the time it was truly diagnosed, about a year had gone by. It was an aggressive cancer. She seemed to be in remission after the initial treatment, but then they discovered that the cancer had spread to her spine. We stayed very close during her illness. Her life was consumed with treatments and trying to stay well and positive. During the last two months, I was at the hospital every day, going on my way home from work. I felt that I needed to be there as much as I could, representing the corner lunch table girls, letting her know that we were thinking about her. At the very end, our other friends would come in from out of state, stay with me, go to the hospital and come back. We’d cry together, or some of them got drunk out of their minds just trying to anesthetize what we knew was going to happen. One morning I was getting ready for work and her husband called and said, “I need a Mount Girl here.” Our school was Mount St. Mary’s and we were the Mount Girls. I never went to work that day. At that point she was in a coma. Everybody knew it was only a matter of time. I was in the room when she died. Even though you know the end is coming you just stay strong, until you know that she’s gone. And then you just totally lose it. During the last two months or so when I was at the hospital a lot, my life was consumed with Susan and her husband and trying to help take care of her girls. During it all, Phil, the man that I was dating at the time was steady, strong and supportive, visiting Susan in the hospital and holding me when I was upset. Phil was friendly with Alan, Susan’s husband, and he was great about all the girlfriends coming to the house. For years he had been saying, “It’s stupid for both of us to have houses in Essex County, New Jersey. We’re both paying taxes and it’s excruciatingly expensive.” So we walked to see this little tiny house. Later, as we were sitting on the beach talking about the house and about Susan, I realized the value of him being my anchor, being as loving to Susan as if he grew up with her. That Sunday night, sitting in his house, I agreed to sell my home, move in with him and buy the little tiny house at the beach. Ultimately we got married and whenever we have an argument about the beach house, we call it Susan’s house, because she made us buy it. I always think that she was up there, wherever souls disappear, saying, “Go Laura, what are you holding out for?” So that impacted me a lot. The girlfriends, the corner lunch table girls, are very dear, even though we don’t connect that often. After Susan’s passing, I knew that her husband Alan was saddled with many medical bills, including many not covered by insurance. In his desperate wish to keep her alive, he had agreed to some risky, experimental procedures not covered by insurance. So I organized a campaign to raise some money to help him. I made arrangements at his bank for any donations to go directly into his account. Even the woman at the bank gave a donation! It was quite an emotional phone call when Alan discovered the money at his bank. I felt good about raising the money. Susan had asked me to take care of him. It was honoring her by helping her husband. I have other good girlfriends, but I miss her. We did so much growing together; I don’t think you can replace that. We had a magical connection. 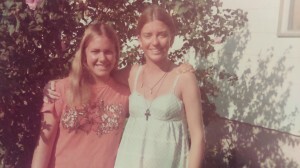 Before Friendship Dialogues was a gleam in founder Ellen Pearlman’s eyes, a group of over two dozen women answered her online plea for women who had lost a female best friend. Ellen is eternally grateful to all the women, including Laura, for opening their hearts to her and sharing their personal stories of love and loss. It was through this process that the seeds for Friendship Dialogues were planted. Thank you!